Wish your Honda had army tank capabilities? Luckily, Russian DIYers have come up with a totally badass conversion kit that uses tank treads to turn your car into a monster. 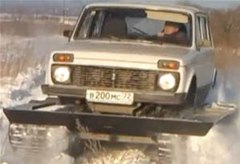 "As shown in the video below, the system can convert any car, from an SUV to a Lada, into a tracked monster. This conversion comes from the city of Chelyabinsk, which once hosted so many T-34 manufacturing plants that the city got the nickname 'Tankograd'. And, since a disaster in 1957 at the nearby Mayak nuclear reprocessing plant turned Chelyabinsk into one of the world's most contaminated cities, these tank treads also come in handy for running over any roving mobs of radiation mutants one might encounter." I think this is terribly imaginative in that it creates a solution for a problem that does not exist. Our coder, Marat, believes these well mannered Russians may well be his long lost cousins because of their enduring fascination with anything that has a motor. These are like those clip on roller skates they used to sell. And those were awesome, this is better. In the way things moves in romania (i mean the public roads) , i guess this revolutionary ideea would worth milions!